Despite what appearances may dictate, Don is trying to figure out how to sell cigarettes. Now The Pop Culture Historian does something else new: Review a televised drama. I’ll admit that I jumped on the bandwagon late, having finished the first season of AMC’s Mad Men when season 5 is about to start in four days. But from what I have seen, I can say that I need to do my best to catch up. Mad Men is named after the term coined by advertising agents on Madison Avenue in New York for themselves, and it surrounds one Donald Draper (Jon Hamm), an executive of the advertising agency Sterling-Cooper. Don has it all: Money, a beautiful wife (January Jones), and the uncanny ability to rack up one success after another in his ads. Of course nothing is quite what it seems. Don has to use all his wit to stay on top of his game, even with accounts executive Peter Campbell (Vincent Kartheiser) attempting to undermine him at every move and with his own past potentially catching up to him. AMC shows in general are not made on budgets as high as shows like Lie to Me or House, M.D. As a result, it is generally quite obvious the sets used throughout (particularly for the Sterling-Cooper office) aren’t very elaborate. 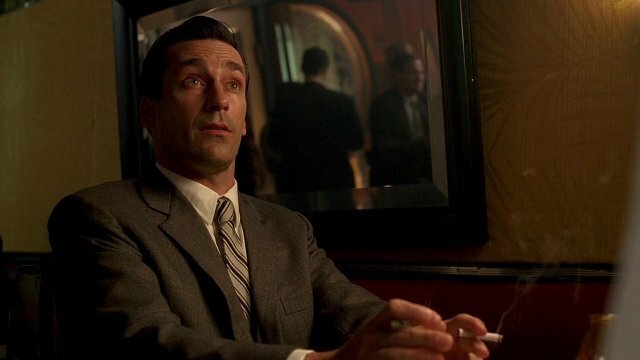 Nonetheless, Mad Men created a very strong, believable 1960 New York atmosphere. What Mad Men does have, however, is great acting all around with some great writing. I’m pretty sure that much of Mad Men’s success can be attributed to Jon Hamm’s portrayal of Don Draper. I think it’s safe to say that Don more or less exhibited what every man strives to be in his success both at his job and with women. Contrasting him, you have Dartmouth alumnus Pete Campbell, who is quite used to having everything he wants handed right to him. For the latter character, I think Vincent Kartheiser also did a terrific job. However, the character who really stole the show for me was Bertram Cooper (Robert Morse). Cooper, one of the partners of Sterling-Cooper with a love of all things Japanese, has been a relatively minor character, but he has been entertaining to watch in his brief appearances with his wisdom and eccentricity. This first season overall seemed like it was dedicated to build the characters up. The main story arc was the issue of Don’s past catching up to him, and as a result he got the most development. That is not to say anyone got the short end of the stick, quite the opposite in fact. A theme of Mad Men is that nothing in advertising is what it seems, and that manifested itself in the characters as the show explored both their professional and personal lives. The only issue I take with the first season of Mad Men was that it was a little bit on the slow side. Nonetheless, I feel inspired to get through seasons 2-4 as quickly as I can now that season 5 is starting up. I have the series on my Netflix Watch Instantly…it’s my goal to give the first season a try this summer considering many people I know love it.